Why Is Flat Design 2.0 Changing Websites? 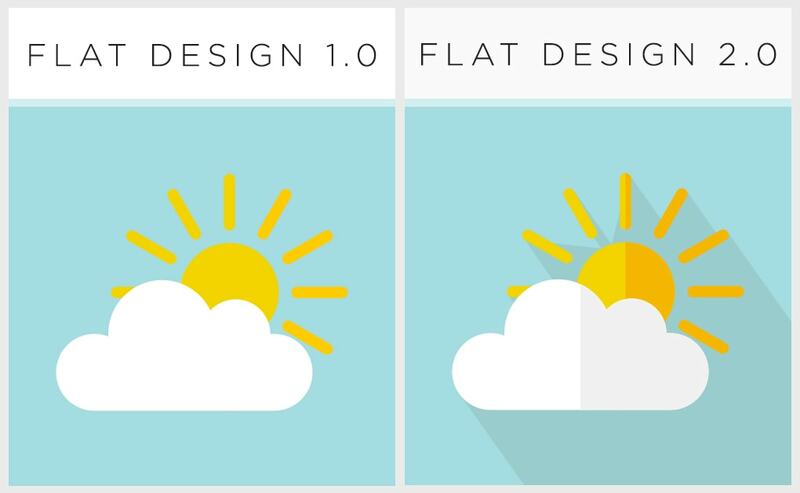 Flat design is a style of graphic that uses minimalistic features in a two-dimensional manner. The inception of flat design stemmed from the hyper-realistic graphics of “web 2.0 design” from the early 2000’s. That design style started to feel cluttered from a user’s perspective, thus the pendulum swing toward flat design that followed. In order to make designs cleaner and enhance the visibility of key calls-to-action, designers gravitated toward the minimalistic flat design approach to remove as many distractions as possible. After flat design (1.0) took off in the design world, we designers and UX researchers started to notice small issues with usability. For example, some users didn’t realize that buttons without shadows, textures or gradients were clickable, ironically making it harder to find the call-to-action. 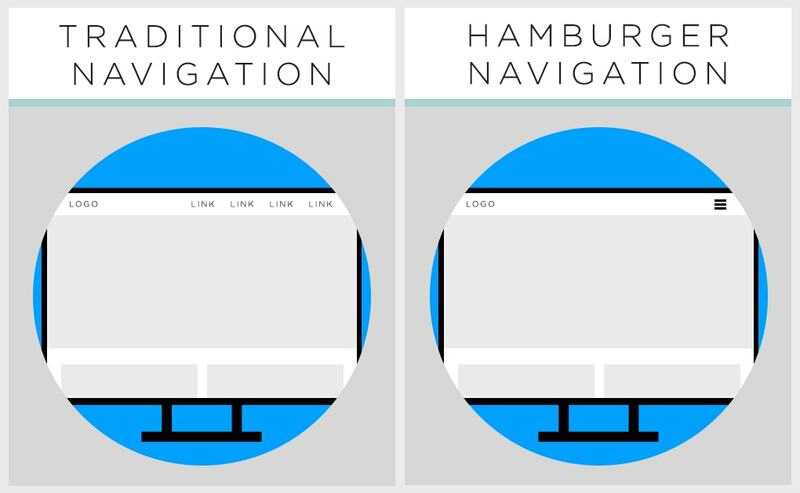 Another example of confusing flat design (1.0) is when designers would condense the main navigation links into the three-lined icon (commonly called a hamburger navigation). This gave websites a clean, minimal look since there wasn’t a lot of words at the top of each page; but, in some instances, users would miss the website’s entire navigation due to the easy to miss three lines. Users didn’t know they needed to click the hamburger menu icon to view the interior page links, which caused some obvious problems for time on page, pages per session and other website behavior metrics. UX research eventually revealed that users needed a little more than flat design offered. 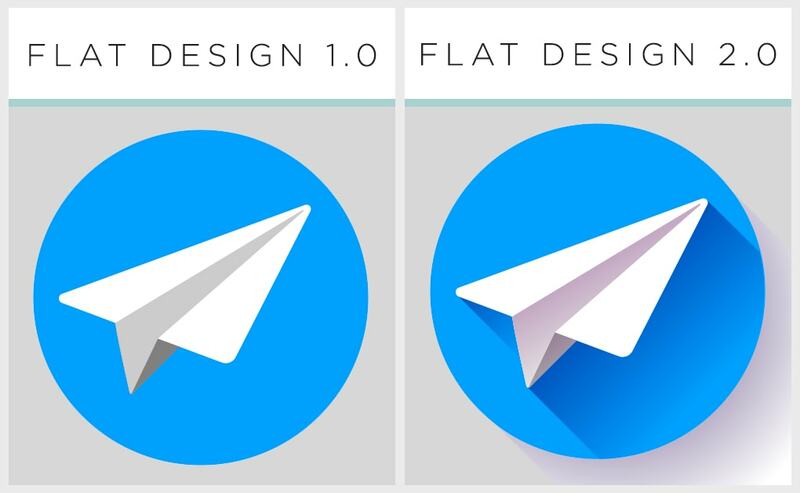 Out of the usability hurdles of flat design 1.0, flat design 2.0 was born. This newer interpretation of design is sometimes referred to as “semi-flat,” “almost flat,” or “flat 2.0,” as Kate Meyer points out. While maintaining the simplicity of flat design 1.0, flat design 2.0 adds small details and visual cues back into the graphic (such as shadows, or slightly more descriptive text) to help more users convert by understanding they can take action. Since Blue Compass is focused on creating beautiful web designs that point users toward maximizing conversions, our Iowa web designers believe flat design 2.0 is the best of both worlds! We highly recommend combining web design with user experience (UX) research to achieve a responsive web design that creates the best experience for users and great results for the business behind the website. Is the flat web design trend here to stay or is another style on its way? Will there be a flat design 3.0? No matter the name of the next web design style, we know designers have learned that without considering UX research, your designs might not be helpful to the users on your website and could miss out on more conversion opportunities for your business. Our Iowa web designer's prediction is that flat design will continue to evolve, eventually becoming more and more realistic. This means more detail throughout, such as on character’s faces or additional layers of color that hints towards a three-dimensional object. If this prediction comes to fruition, will it be called “flat design 3D?” Let us know your thoughts below! Want to update your website from flat design 1.0 to flat design 2.0? Our Iowa web development and web design teams can take your website to the next level.